NEW SPRINGVILLE-GORGEOUS TWO FAMILY NEWLY RENOVATED THROUGHOUT. MAIN UNIT FEATURING 4 BEDROOMS WITH 2.5 BATH, LIVING ROOM, SPACIOUS KITCHEN WITH GRANITE COUNTER TOPS AND HIGH QUALITY CABINETS, HUGE EIK WITH ISLAND,STAINLESS STEAL APPLIANCES, LAUNDRY ROOM; 1 CAR GARAGE AND 2 CARS DRIVEWAY, STORAGE ROOM THAT CAN BE USED AS FAMILY ROOM, DECK WITH LARGE BACKYARD AND QUIET PARK BEHIND, CENTRAL HEAT/COOLING. RENTAL UNIT FEATURING 1 BEDROOM IN EXCELLENT CONDITION, TENANT PAYS $1300/MONTH. 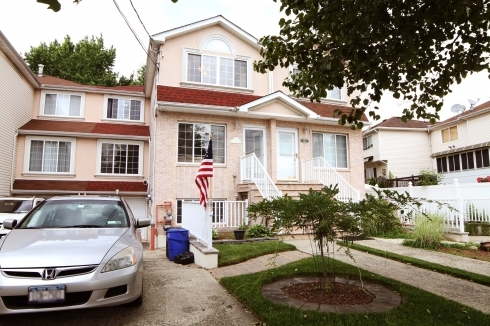 CONVENIENTLY LOCATED CLOSE TO STATEN ISLAND MALL, SCHOOLS, PARKS, HIGHWAYS AND EXPRESS BUSES TO MANHATTAN.